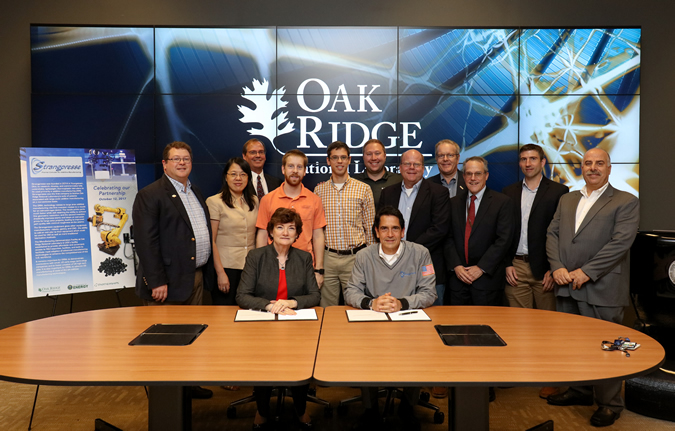 OAK RIDGE, Tenn., Oct. 12, 2017 – Ohio-based Strangpresse has exclusively licensed additive manufacturing-related extruder technology from the Department of Energy’s Oak Ridge National Laboratory (ORNL) that can quickly print hundreds of pounds of polymer material. The MDF is supported by the DOE Office of Energy Efficiency and Renewable Energy’s Advanced Manufacturing Office. AMO supports early-stage applied research and development of new materials, information and processes that improve American manufacturing’s energy efficiency, as well as platform technologies for manufacturing clean energy products. This entry was posted in News and tagged Bill Peter, Brian Post, Hapco Inc., large-scale additive manufacturing, Oak Ridge National Laboratory, ORNL, Strangpresse by AM. Bookmark the permalink.